I’m going to make this blogpost short and sweet. As I continue to learn more about the hip thrust exercise I will continue to update you with my realizations. The Airex pad works better than the Hampton thick bar pad. When you buy a Hampton thick bar pad, the barbell can fall through the slits. When my client Steve Hammond and I were regularly thrusting with over 500 lbs (Steve with 585), the pad eventually eroded. I imagine that if we trained regularly with the pad it would last around a year with the amount of deformation it experienced. It seems that the Airex pad is much more durable and will last for many years. With the Airex pad, you don’t have to worry about the bar faling through the slit. Finally, if you buy an Airex pad, you can use it with quadruped movements such as pendulum quadruped hip extensions, half-kneeling exercises such as half-kneeling cable anti-rotation presses, and even as padding for Zercher squats. This is a no brainer if you ask me! 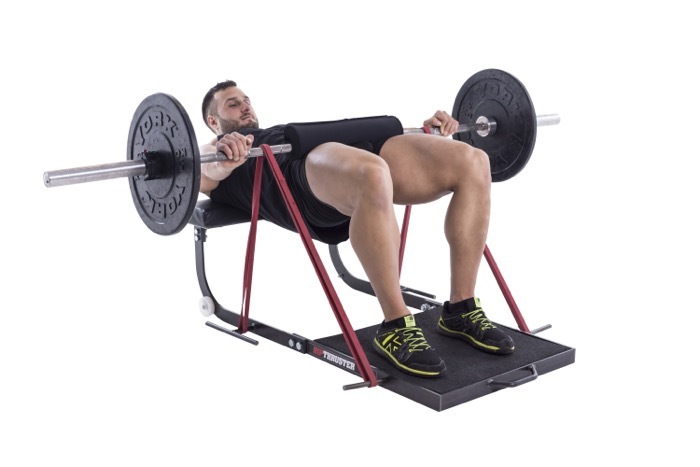 Many benches are too high for optimal hip thrust performance. My bench at home was perfectly suited for maximum glute activation, but it was lower than many benches you’ll find in gyms. I’m very tall, 6’4″ to be exact, and the benches at the gym here at AUT are too tall for me to comfortably perform the hip thrust. The benches here measure 18.5″ in height. The bench I had back home in Phoenix was 16″ in height and was perfect for me. The post New Trends in Hip Thrust Performance appeared first on Bret Contreras. The post The 8-Week Hip Thrust / Leg Extension / Nordic Ham Curl Experiment appeared first on Bret Contreras. The post The No Barbell Experiment On Squat And Deadlift And Hip Thrust Strength: The Results appeared first on Bret Contreras. The post Science is Self-Correcting – The Case of the Hip Thrust and its Effects on Speed appeared first on Bret Contreras.